The entrance hall of Fatehpur Sikri in Agra. Today we woke up at 6 and pack our belongings because today we have a long drive to Agra. The drive to Agra took about 6 hours, but we were stopping at Fatehpur Sikri first for a short tour in the palace. Landscape on the road to Fatehpur Sikri is not very amusing, consist of only farms, localmarkets and few temples. We stopped once at a restaurant on half way to Fatehpur Sikri, which again charged a coca cola for 110 rupee each can ($2). The tourist season is January to March, so we are the only visitors in the restaurant. We also take a pee, when you are about to wash your hands a boy or girl will help you open the faucet and give you tissue, so we tip them 40 rupee. At eleven o’clock we met our local tour leader in a gate entering Fatehpur Sikri, a tall man in his forties with clean cut mustache and neat appearance. He got in our car and introduced himself as our tour leader for today and tomorrow. Our car stopped in a large parking lot among other cars, in India most cars are white to reflect the sunlight which could heat the car, just like in Dubai. 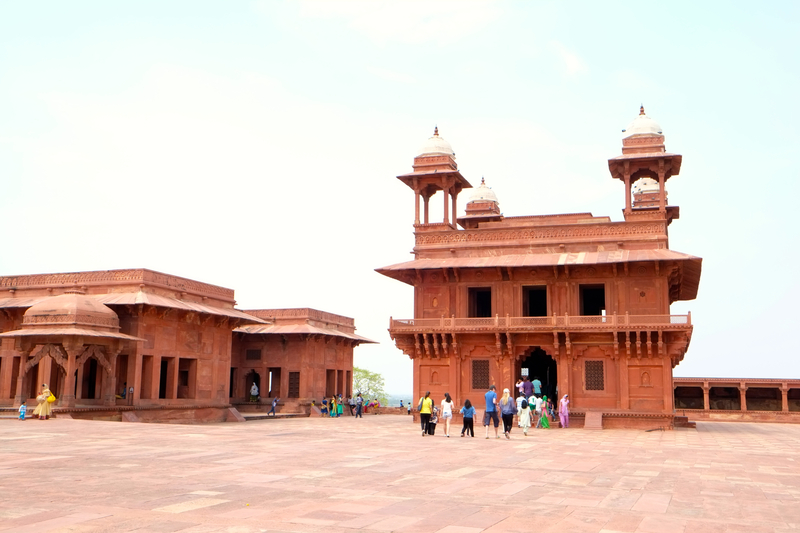 Fatehpur Sikri’s building for the King and his religious advisor to meet. 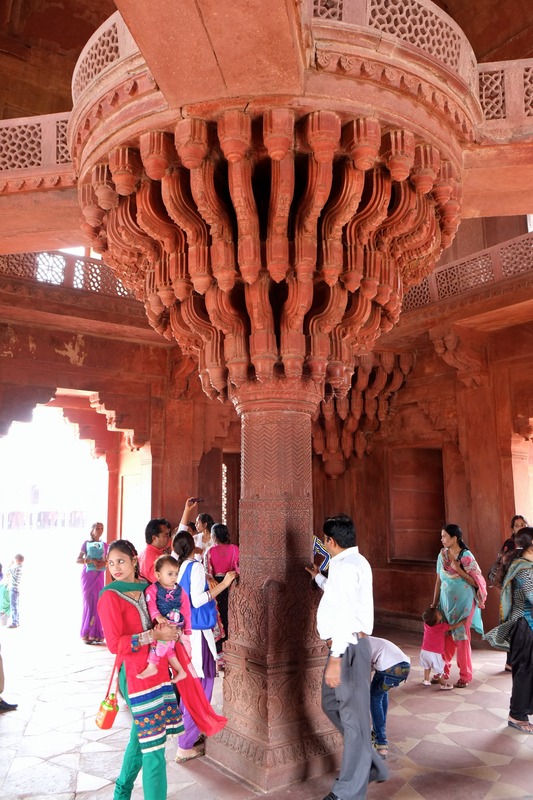 Fatehpur Sikri is a political capital of India’s Mughal Empire under Akbar’s reign from 1571 till 1585 and regarded as the crowning glory of his architectural legacy. 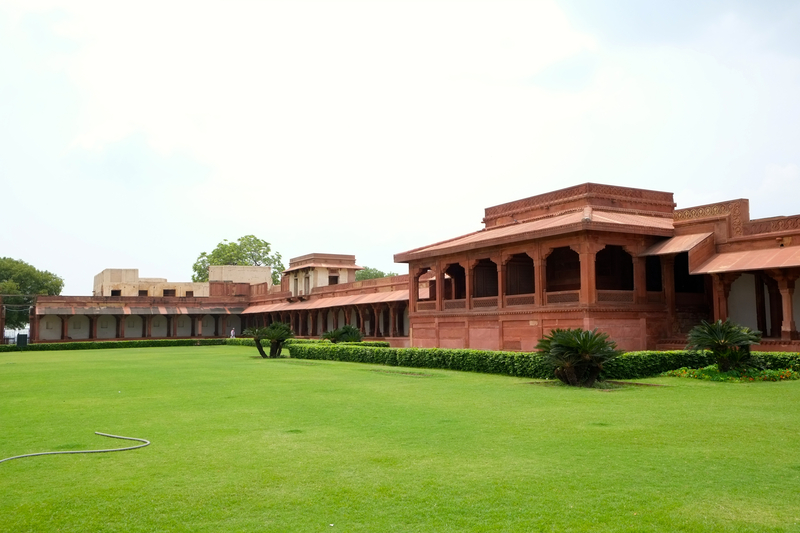 Fatehpur is the name of the palace where the King live, while Sikri is the name of village where the residents live. To get up the hill, where Fatehpur located we have to take a local taxi ride, basically it is a mini bus for 15-20 people, non air conditioned, and driven recklessly. The bus ride took 10 minutes to the hill and stopped at the ticket gate. The mixed carving on the wall symbolising various different religion. Our guide is very fluent in English and he told a very complete story about Akbar wanting to have a son and went to Fatehpur to meet a wise man, then built the palace there to give appreciation for him. But after 12 years he left Fatehpur Sikri and move to Lahore due to lack of water. Fatehpur Sikri is quite large, with courts and yard. I also learn the meaning of “Guru” or teacher which was taken from Sanskrit languange, “Gu” means dark while “ru” means light. So Guru means the person who bring us from dark to light. The architectural design was a mixed from Mughal (Moslem) and Hindu religion, but Akbar actually respect all of the religion and made his own religion, “Th Religion of God”. Fatehpur Sikri. Building on the left for gold and precious storage, also for King’s guru to live. Building on the right is the meeting building. After 2 hours touring Fatehpur Sikri we descent the hill and went back to the parking lot to meet Ram and continue our drive to Agra. 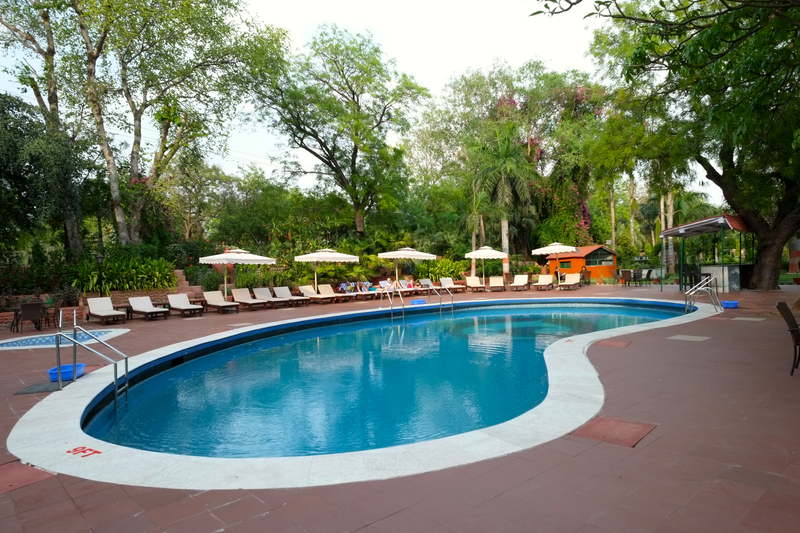 We arrived at our hotel in Agra, Clark Shiraz which is a wonderful 4 star hotel with swimming pool and great rooftop bar.Since we arrived at 3 pm, we miss our lunch and have to pay ourselves eating in the cafe at lobby. My mother had a chicken burger and I have pizza, we both drink tea, all of them cost us INR 1500 ($35). After our lunch we went to the hotel’s swimming pool where some western tourist were sunbathing. Swimming Pool at Clarks Shiraz in Agra, India. 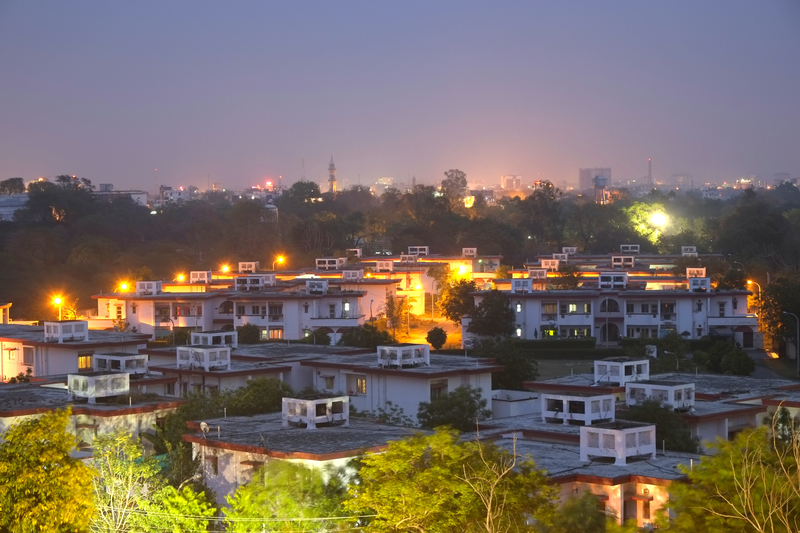 Agra is a city located on the banks of Yamuna River, known as the capital of Mughal Empire from 1526 to 1628. It is also a major tourist attraction due to various splendid Mughal-era monuments, including the legendary Taj Mahal, Agra Fort, and Fatehpur Sikri, three of them being UNESCO World Heritage Site. At the hotel we also bought refrigator magnets for a very cheap price for souvenirs, 6 magnets for 100 rupee ($2). In hotel room we surf the internet with the wifi voucher I bought earlier from the hotel, 575 rupee for 24 hours and two device. I’m looking for information about Taj Mahal and which gate is the best for entry at sunrise (West Gate is the answer). We relaxed, showered, then went to the rooftop bar at around 6 pm. As usual, I set up my tripod facing the city and spent 30 minutes taking long exposure. We headed to restaurant for dinner and slept early, because we have to go to Taj Mahal at 5.15 from the hotel tomorrow morning. 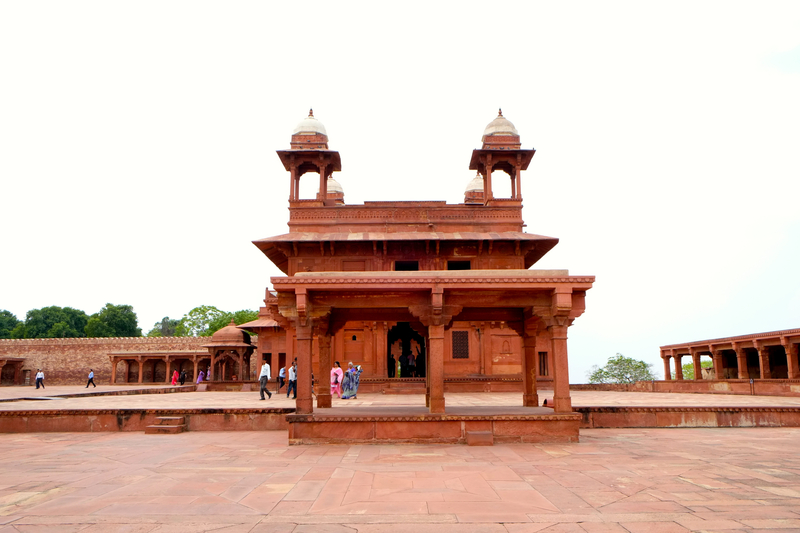 This entry was posted in India, Travel and tagged agra, akbar, clarks shiraz, fatehpur sikri, India, mughal, religion, Travel, trip, unesco, world heritage. Bookmark the permalink.